This post is sponsored by Mountain Rose Herbs. The in-between seasons are very common times to get sick: allergies flare up, digestive woes rekindle and the flu makes it rounds. I find the plant kingdom loves to gift us cures during these wet seasons. Mushrooms pop up after spring rains. Forest floors glow unearthly green with rain-soaked nettles. Dandelion sinks its pale roots deep into the earth, splaying dark ridged leaves, yolk-yellow flowers sighing pollen up and out. During these times I sip broth, reviving my over-wintered spirit with deeply nourishing liquids, bringing vitality to all the nooks and crannies still hibernating. When I went to develop this mushroom broth with the help of my friends over at Mountain Rose Herbs I had one thing in mind: make it vital. There are about a billion vegetable broth recipes out there, all of which essentially boil down (hehe) to "put a bunch of veg in a pot, boil it, strain it, voila!” While doing research for this recipe I even saw some “vegan bone broth” out there that’s essentially regular vegetable stock with miso paste and seaweed. That's all well and good. But I think we can do better, don't you? Most herbalists and nutritionists will tell you bone broth is one of the keys to improved health. Bone broths are deeply nourishing, providing a bevy of vitamins, gut-healing collagen, minerals and so much more. 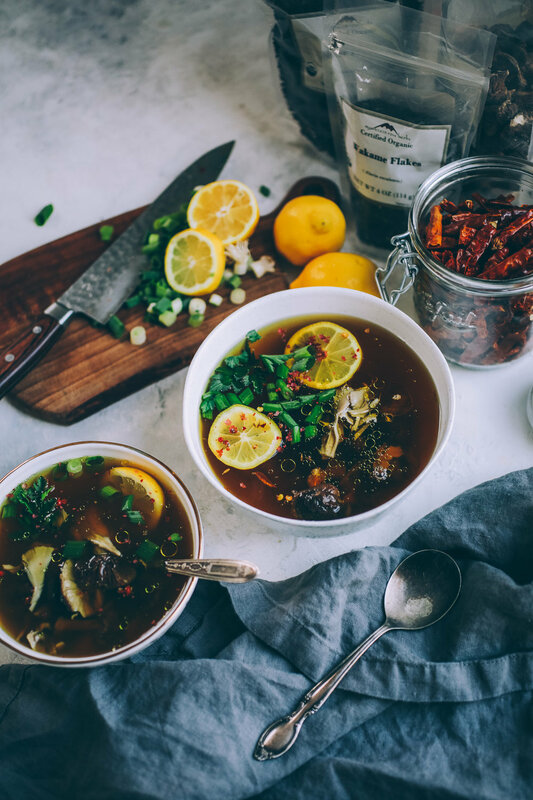 But there are many of us who would prefer to keep our broth plant based thankyouverymuch.So how do you make a plant-powered broth with comparable nutritional benefits? Well, this recipe is the answer to that query: a vegan mushroom broth made with reishi, shiitake, maitake, dulse, wakame, miso, turmeric, ginger, garlic, veg and spices. It's has everything but the kitchen sink, but don't let that intimidate you! It's as simple as any homemade vegetable stock recipe. All it requires is some chopping, simmer time and straining. It’s a great recipe for your next meal-prep day! Plus you can set it and forget it if you make it in a crock pot. But what does it taste like? This broth is deeply savory, rich, nutty, vegetal and herbaceous with a saltiness from the miso and seaweed that reminds me of the ocean. The mushrooms give the broth a chicken-like flavor. It’s the most meat-like vegetable broth I’ve ever tasted! This plant-based broth functions similarly to bone broth, helping to improve gut health, boost the immune system and remineralize the body. The mushrooms act as digestive system and immune system allies; seaweeds provide iodine, B-vitamins and essential minerals; turmeric and ginger reduce inflammation; garlic fights viruses and infections; and fresh unpasteurized miso paste gives you a probiotic boost. The vegetables in the broth offer vitamins and minerals as well. 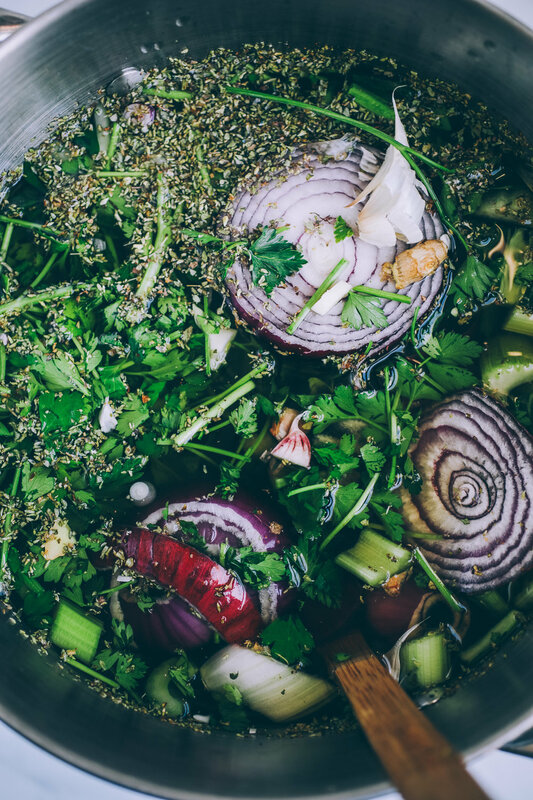 Here's a list of resources for you to peruse to give you an idea of how amazing this broth is! Reishi Mushroom: benefits and how it works. Shiitake mushrooms: 8 scientifically proven benefits. Maitake: 5 unique health benefits. Turmeric: an anti-inflammatory super star. Everything you ever wanted to know about miso. What is a mineral deficiency? Sip-as is in your favorite mug with a squeeze of fresh lemon and a pinch of cayenne! Use as a base for homemade pho, ramen or other favorite soups! I like to serve it with fresh sliced scallions, parsley, mushrooms reserved from the stock-making process, cubed firm tofu and millet ramen. So good! Use it as the liquid base when cooking grains like rice, millet and quinoa. Using dried mushrooms makes this broth super concentrated and potent. 1 lb of dried mushrooms is roughly 10 lbs fresh, for reference. If using dried mushrooms, note that you can dilute this broth a lot and still get a lot of benefit in every diluted cup. However, you can use smaller amounts of dried mushrooms or sub equal amounts of fresh mushrooms for a more affordable and equally excellent broth. I used red miso paste in this recipe, the strongest-tasting miso. It tastes like fermented salted plums and parmesan cheese. You can sub it out for mellow white miso, but you may need a few more tablespoons white miso to balance out the flavor. You can sub maitake mushrooms for shiitake if you can’t find it. To make this broth more affordable, buy your spices in bulk and get just the amount you need. Also, fresh shiitake and maiitake are always cheaper than dried. Add 12 cups water (3 quarts) to an 8 quart stock pot and set over medium-high heat. Add your reishi mushroom slices, shiitake mushrooms and maiitake mushrooms. Simmer the liquid until reduced by half -- the cook time here varies but it generally takes 45-60 minutes. Note: to reserve the shiitake / maiitake for eating (highly suggested!) strain off the mushrooms and remove the reishi slices from the cooked mushrooms. Reserve the mushroom tea, this is the base of your stock! Set the shiitake and maitake mushrooms aside for serving or adding to another meal later. Add the mushroom tea back into your stock pot and add the reishi slices back into the stock water. Add the onion, celery, carrots, kale stems, parsley, sun-dried tomatoes, ginger, garlic, oregano,thyme, cumin, fennel, sea salt,black pepper and apple cider vinegar to the mushroom tea. Add the rest of the water -- 12 cups (3 quarts). Simmer covered for 30-60 mins. You want the liquid to reduce by at least 1/4 and the vegetables to be meltingly soft. Turn the burner off and let cool for 10 minutes (safety first!) before straining off the cooked plant-material into another large pot. Compost the used plant material. Add the turmeric powder, dulse, wakame and a generous swirl of virgin olive oil to the broth. Once the broth is properly cooled to a palatable temperature, add the miso paste (this preserves vital nutrients and living bacteria in the miso). Taste and adjust salt and spices as you like. If the broth seems a little strong for your liking you can dilute it with more water. Pour yourself a mugful, sip and sigh with delight at a job well done! You can also make this into a fabulous soup by adding fresh sliced scallions, some of the reserved mushrooms and diced firm tofu. I like to add some millet ramen noodles as well. So delicious! Store in large mason jars up to 1 week. Broth can be frozen for 1 month. This post is sponsored by Mountain Rose Herbs. Thank you for supporting the brands that support this site.